Residents in Edenderry voiced their opposition to a new inner relief road plan being pursued in the town by Offaly County Council on Thursday evening, January 17. The opposition came at a public Part 8 meeting, held by the council, and attended by more than 200 residents, in the hall of Scoil Bhride in Edenderry. The meeting heard that the council-led project seeks to construct an inner relief road connecting the Dublin Road from the roundabout at Tesco, through a number of housing estates in Clonmullen, to the Carrick Road at Clonmeen Rise, and further out to Monasteroris, effectively bypassing the town from the Dublin side to the Tullamore side. The road, which is estimated to cost €4.5 million, will affect residents in Clonmullen who have previously voiced opposition to the road which will pass through a number of built-up areas. They, along with local councillor Noel Cribbin, have suggested an alternative route, starting closer to the Boyne Bridge on the Dublin road, connecting similarly to the Carrick Road in the town, a route the council says lies on a flood plain and is unlikely to get approval from the Department of Transport. Area Engineer with the council, Mark Mahon, told the gathering that the inner relief road was being sought in response to Edenderry's growing population and the knock-on increase in traffic locally. He said that studies show the number of cars travelling on the Dublin road in the town has grown from 9,500 in 2015 to 12,500 in 2017. He also noted the high percentage of people from the town who commute to Dublin for work, pointing out that, at present, all of those people must travel through the centre of town and in and out the Dublin road in the mornings and evenings. He suggested the new inner relief road would alleviate the current congestion and allow local traffic to enter and leave the town at different points, dispersing the traffic volume accordingly. He also noted the route would open up currently unused zoned lands for commercial and housing developments. Speaking about the alternative route closer to Lawton and Foley on the Dublin road, Mark said various CFRAM reports dating back to 2002 show "a significant flood risk," suggesting that even piling foundations and raising a road at that location would simply push the flooding problem back down into lands at Kishawanny. He told the meeting that this route could cost upwards of €60 million and that it would be unlikely to get approved by the department, who he said would insist that "all cheaper options be exhausted first." 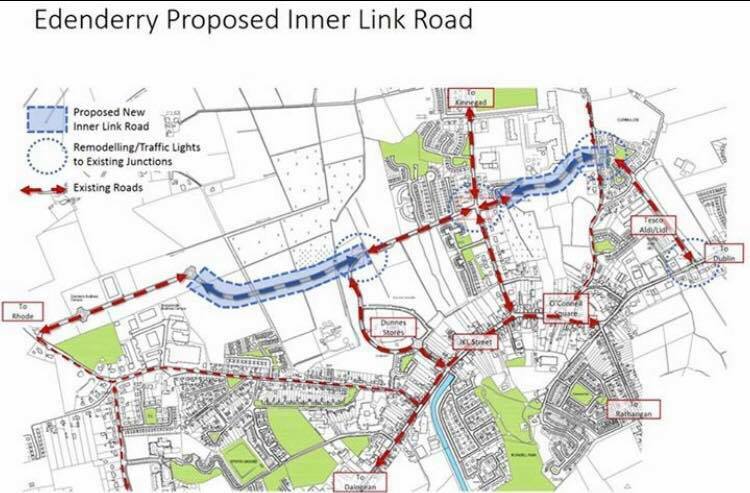 Read also: READER'S POLL: Do you agree with Edenderry's planned inner relief road? Most people in attendance at the meeting were residents in the Clonmullen area where traffic would funnel through as a result of the inner relief road. Speaking about the obvious safety concerns, Mark Mahon said it was a council priority to "safeguard all existing residential areas." He said traffic calming measures like ramps, pedestrian crossings, protective fencing around green areas and driver feedback signage, were being considered for the areas. In response, a number of residents spoke against the inner relief road development, suggesting the council should know whether a roundabout or traffic lights will be installed at the Tesco filling station before bringing a Part 8 to the public. They also argued that safety concerns for residents and children in the affected areas had not fully been addressed by the council. Mark Mahon admitted that the junction type at Tesco filling station "hasn't been determined yet," adding that an ongoing expert transportation study would ultimately lead to a decision on that front, suggesting the study would ensure the most "up-to-date" solution was found. Two residents pushed the safety issues, suggesting Clonmullen was not suitable to take possibly 6,000 vehicles a day. A man who said his grandchildren lived in the area, raged against the road proposal being "pushed through" despite the danger, while another woman shouted, "it will take a child being killed to show just how dangerous it is." Mark responded by saying the public was being invited to make submissions on traffic calming to decide what is and isn't suitable in the area, reiterating the council's priority to ensure safety. He pointed out that more than 15,000 cars travel through Arden View in Tullamore safely every day thanks to traffic calming and protective fencing on green areas. A resident retorted, "no other estate in Offaly is taking the volume of cars and especially HGVs that Clonmullen is being asked to take in this proposal. It's an absolute disgrace and it's time Edenderry stood up and demanded better than we're getting here." A number of residents pushed for clarity on whether the adjoining roads, notably at Clonmullen and Clonmeen Rise on the Carrick Road, as well as from the Edenderry Business Campus in Monasteroris to the junction from Killane, were able to take an increase in traffic, including HGVs. He denied an accusation from the crowd that there was a third party interest from Rosderra Meats which is located on the route. Mark said, "we will never solve all issues with one proposal," but insisted the new road in its entirety would be suitable to take all forms of traffic. He also said the council was working on design solutions for areas that would see increased traffic as a result of the new road, including on the Carrick road and at Monasteroris. Anti-social behaviour and the potential for criminal activity, including burglaries and so-called 'boy racers' was also raised as an issue by a number of people in attendance. Mark insisted that traffic calming would tackle misuse of the road while he said security fencing would be part of the design in order to protect people's gardens from any criminal intent. Another member of the gathering accused the council of ignoring the public, suggesting opposition to the recent streetscape works and narrowing of the main street in 2007, as well as the pedestrianisation of O'Connell Square last year went unheard. Mark responded by saying, "this is a democratic process and the purpose of this public consultation is to get the best shape on the ultimate design." He, along with Director of Finance with Offaly County Council, Declan Conlon, and Cllr Eddie Fitzpatrick, chairperson of the Edenderry Municipal District, implored people to make their submissions in writing. Councillors Liam Quinn, John Foley, Noel Bourke and Noel Cribbin were also in attendance. Written or email submissions are welcomed until February 8 to innerreliefemd@offalycoco.ie or, in writing, headed 'Edenderry Inner Relief Road,' to Mr Seán Murray, Director of Services, Roads, Environment & Water Services Offaly County Council, Áras an Chontae, Charleville Road, Tullamore, Offaly.